Guernsey is an island in the English Channel, just off the coast of Normandy and along with Jersey, and a number of smaller islands including Alderney, Sark, Herm, Jethou and Lihou, Guernsey forms part of the Channel Islands. With a total land area of seventy eight square kilometres, and a coastline of fifty kilometres, the landscape of Guernsey is dominated by its coastal features. 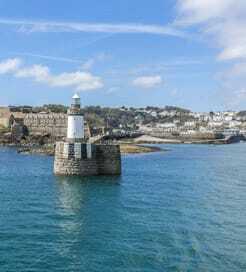 Of its population of just sixty seven thousand, around a quarter live in St Peter Port, which is Guernsey’s capital, as well as its main port, providing a gateway to the island from France, neighbouring Jersey and England. The unique blend of French and English culture and the fact that both languages are spoken widely on the island make Guernsey a popular destination for visitors from the UK, France, and other parts of mainland Europe. Getting to Guernsey by ferry is a relatively painless experience with a choice of departure ports from both sides of the channel as well as inter-channel-island services from Jersey. 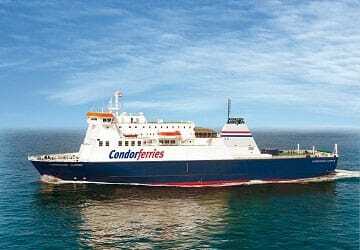 Condor Ferries operate year round crossings from Portsmouth, Jersey and St Malo with both conventional and fast ferries, as well as a seasonal service from Poole. Manche Iles Express operates passenger only services to Guernsey from the French ports of Diélette, Carteret and Granville at various times throughout the year with some services travelling via Jersey. The island has an extensive bus route, which makes travelling around by public transport relatively straightforward. St Peter Port is well connected to the bus routes, meaning you can travel quickly and easily from your ferry to your final destination by bus. There are also a number of car hire options available at the ferry port and airport, for visitors who want the most flexible and self-contained transport option. The island does have some unusual traffic rules and a maximum speed limit of 35 mph across the entire island, which can take some visiting driver by surprise. For more information, please visit our Ferries from England to Guernsey page. For more information, please visit our Ferries from France to Guernsey page. For more information, please visit our Ferries from Jersey to Guernsey page.